The desktop computer power supply changes alternating current from a wall socket of mains electricity to low-voltage direct current to operate the processor and peripheral devices. Several direct-current voltages are required, and they must be regulated with some accuracy to provide stable operation of the computer. A power supply rail or voltage rail refers to a single voltage provided by a power supply unit (PSU). First-generation microcomputer and home computer power supply units used a heavy step-down transformer and a linear power supply, as used, in for example, the Commodore PET introduced in 1977. The Apple II, also introduced in 1977, was noted for its switched-mode power supply, which was lighter and smaller than an equivalent linear power supply would have been, and which had no cooling fan. The switched-mode supply uses a ferrite-cored high frequency transformer and power transistors that switch thousands of times per second. By adjusting the switching time of the transistor, the output voltage can be closely controlled without dissipating energy as heat in a linear regulator. The development of high-power and high-voltage transistors at economical prices made it practical to introduce switch mode supplies, that had been used in aerospace, mainframes, minicomputers and color television, into desktop personal computers. The Apple II design by Atari engineer Rod Holt was awarded a patent, and was in the vanguard of modern computer power supply design. Now all modern computers use switched-mode power supplies, which are lighter, less costly, and more efficient than equivalent linear power supplies. The ATX standard followed some manufacturers design to have power supplies also supply a standby voltage, so that most of the computer system could be powered off after preparing for hibernation or shutdown, and powered back on by an event. When the computer is powered down but the power supply is still on, it can be started remotely via Wake-on-LAN and Wake-on-ring or locally via Keyboard Power ON (KBPO) if the motherboard supports it. This standby voltage is generated by a smaller power supply inside the unit. The standby power source was a small linear power supply with conventional transformer, which was later changed to a switching power supply, sharing some components of the main unit due to cost- and energy-saving requirements. A typical XT PSU power switch, which is an integral part of the PSU. The +12 V supply was used primarily to operate motors such as in disk drives and cooling fans. As more peripherals were added, more power was delivered on the 12 V rail. However, since most of the power is consumed by chips, the 5 V rail still delivered most of the power. The −12 V rail was used primarily to provide the negative supply voltage to the RS-232 serial ports. 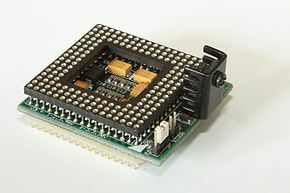 A −5 V rail was provided for peripherals on the ISA bus (such as soundcards), but was not used by any motherboard other than the original IBM PC motherboard. There are two basic differences between AT and ATX power supplies: the connectors that provide power to the motherboard, and the soft switch. In ATX-style systems, the front-panel power switch provides only a control signal to the power supply and does not switch the mains AC voltage. This low-voltage control allows other computer hardware or software to turn the system on and off. Older CPUs and logic devices on the motherboard were designed for 5 V operating voltage. Power supplies for those computers regulate the 5 V output precisely, and supply the 12 V rail in a specified voltage window depending on the load ratio of both rails. The +12 V supply was used for computer fan motors, disk drive motors and serial interfaces (which also used the −12 V supply). A further use of the 12 V came with the sound cards, using linear chip audio power amplifiers, sometimes filtered by a 9 V linear regulator on the card to cut the noise of the motors. Since the first revision of the ATX standard, PSUs were required to have a 3.3 V output voltage rail. Rarely, a linear regulator generated these 3.3 V, supplied from the 5 V and converting the product of voltage drop and current to heat. In the most common design this voltage is generated by shifting and transforming the pulses of the 5 V rail on an additional choke, causing the voltage to rise delayed and rectified separately into a dedicated 3.3 V rail and getting the rising idle voltage cut by a device type TL431, which behaves similar to a zener diode. Later regulators managed all the 3.3, 5 and 12 V rails. Cutting the pulse by the voltage regulator the rato of the 3.3 and 5 V is controlled. Some of these PSUs use two different chokes, feeding the to the 3.3 V rail from the transformer to manage changing loads by pulse with ratio between the 3.3 and the 5 V outputs. In designs using identical chokes, the pulse width manage the ratio. The rule was intended to set a safe limit on the current able to pass through any single output wire. A sufficiently large current can cause serious damage in the event of a short circuit, or can melt the wire or its insulation in the case of a fault, or potentially start a fire or damage other components. The rule limits each output to below 20 amps, with typical supplies guaranteeing 18 A availability. 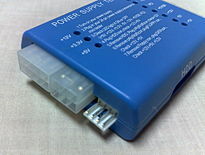 Power supplies capable of delivering more than 18 A at 12 V would provide their output in groups of cables (called "rails"). Each rail delivers up to a limited amount of current through one or more cables, and each rail is independently controlled by its own current sensor which shuts down the supply upon excess current. Unlike a fuse or circuit breaker, these limits reset as soon as the overload is removed. (Obviously, if the group of wires is limited to 20A, so is each wire in it.) Typically, a power supply will guarantee at least 17 A at 12 V by having a current limit of 18.5 A ± 8%. Thus, it is guaranteed to supply at least 17 A, and guaranteed to cut off before 20 A. The current limits for each group of cables is then documented so the user can avoid placing too many high-current loads in the same group. 12 V only connector on a Fujitsu mainboard. Since 2011, Fujitsu and other tier-1 manufacturers have been manufacturing systems containing motherboard variants that require only a 12 V supply from a custom-made PSU, which is typically rated at 250–300 W. DC-DC conversion, providing 5 V and 3.3 V, is done on the motherboard; the proposal is that 5 V and 12 V supply for other devices, such as HDDs, will be picked up at the motherboard rather than from the PSU itself, although this does not appear to be fully implemented as of January 2012[update]. The overall power draw on a PSU is limited by the fact that all of the supply rails come through one transformer and any of its primary side circuitry, like switching components. Total power requirements for a personal computer may range from 250 W to more than 1000 W for a high-performance computer with multiple graphics cards. Personal computers without especially high performing CPUs or graphics cards usually require 300 to 500 W. Power supplies are designed around 40% greater than the calculated system power consumption. This protects against system performance degradation, and against power supply overloading. Power supplies label their total power output, and label how this is determined by the electric current limits for each of the voltages supplied. Some power supplies have no-overload protection. The system power consumption is a sum of the power ratings for all of the components of the computer system that draw on the power supply. Some graphics cards (especially multiple cards) and large groups of hard drives can place very heavy demands on the 12v lines of the PSU, and for these loads, the PSU's 12 V rating is crucial. The total 12 V rating on the power supply must be higher than the current required by such devices so that the PSU can fully serve the system when its other 12 V system components are taken into account. The manufacturers of these computer system components, especially graphics cards, tend to over-rate their power requirements, to minimize support issues due to too low of a power supply. ATX motherboard power connector (usually called P1): This is the connector that goes to the motherboard to provide it with power. The connector has 20 or 24 pins. One of the pins belongs to the PS-ON wire (it is usually green). This connector is the largest of all the connectors. In older AT power supplies, this connector was split in two: P8 and P9. A power supply with a 24-pin connector can be used on a motherboard with a 20-pin connector. In cases where the motherboard has a 24-pin connector, some power supplies come with two connectors (one with 20-pin and other with 4-pin, i.e. 20+4-pin form) which can be used together to form the 24-pin connector. ATX12V 4-pin power connector (also called the P4 power connector). A second connector that goes to the motherboard (in addition to the main 24-pin connector) to supply dedicated power for the processor. 4+4-pin For the purpose of backwards compatibility, some connectors designed for high-end motherboards and processors, more power is required, therefore EPS12V has an 8-pin connector. 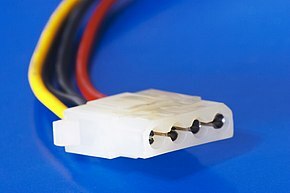 Auxiliary power connectors: There are several types of auxiliary connectors, usually in 6-pin form, designed to provide additional power if it is needed. 6+2-pin For the purpose of backwards compatibility, some connectors designed for use with high end PCI Express graphics cards feature this kind of pin configuration. It allows either a six-pin card or an eight-pin card to be connected by using two separate connection modules wired into the same sheath: one with six pins and another with two pins. Each PCI Express 8-pin connector can output a maximum of 150 W.
A modular power supply provides a detachable cable system, offering the ability to remove unused connections at the expense of a small amount of extra electrical resistance introduced by the additional connector. This reduces clutter, removes the risk of dangling cables interfering with other components, and can improve case airflow. 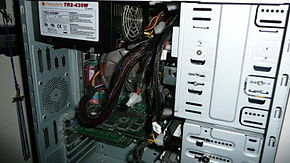 Many semi modular supplies have some permanent multi-wire cables with connectors at the ends, such as ATX motherboard and 8-pin EPS, though newer supplies marketed as "fully modular" allow even these to be disconnected. The Small Form Factor with a 12 V connector (SFX12V) configuration has been optimized for small form factor (SFF) system layouts. The low profile of the power supply fits easily into these systems. The Thin Form Factor with a 12 V connector (TFX12V) configuration has been optimized for small and low profile microATX and FlexATX system layouts. The long narrow profile of the power supply fits easily into low profile systems. The cooling fan placement can be used to efficiently exhaust air from the processor and core area of the motherboard, making possible smaller, more efficient systems using common industry components. ^ a b Light-blue background denotes control signals. ^ a b Light-green background denotes the pins present only in the 24-pin connector. 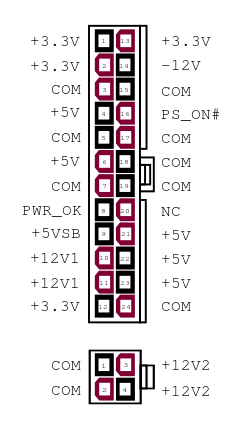 ^ In the 20-pin connector, pins 13–22 are numbered 11–20 respectively. ^ Supplies +3.3 V power and also has a second low-current wire for remote sensing. ^ A control signal that is pulled up to +5 V by the PSU and must be driven low to turn on the PSU. ^ A control signal that is low when other outputs have not yet reached, or are about to leave, correct voltages. ^ Formerly −5 V ( white wire), absent in modern power supplies; it was optional in ATX and ATX12V v1.2 and deleted since v1.3. The voltage of the PSU can be monitored by the hardware monitor of most modern motherboards. This can often be done through a section within the BIOS, or, once an operating system is running, through a system monitor software like lm_sensors on GNU/Linux, envstat on NetBSD, sysctl hw.sensors on OpenBSD and DragonFly BSD, or SpeedFan on Windows. Most of power supply fans are not connected to the speed sensors on the motherboard and so cannot be monitored, but some high-end PSU can provide digital control and monitoring, and this requires connection to the fan-speed sensors or USB port on the motherboard. ^ This figure assumes that the PSUs have not reached the higher failure rate portion of the bathtub curve. ^ Woligroski, Don (December 14, 2011). "Power Supply 101: A Reference Of Specifications". Tom's Hardware. Retrieved July 12, 2018. ^ Torres, Gabriel (2008-03-15). "How Much Power Can a Generic 500 W Power Supply Really Deliver?". Hardwaresecrets.com. Archived from the original on 2008-05-11. Retrieved 2009-03-28. Our generic 500 W power supply died when we tried pulling 275 W from it, so the maximum amount of power we could extract was 250 W – half the labeled amount! ^ "Anatomy of Switching Power Supplies". Hardware Secrets. 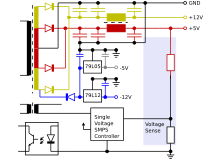 ^ "EPS12V Power Supply Design Guide, v2.92" (PDF). enermax.cn. ^ "ATX12V Power Supply Design Guide, v2.01" (PDF). formfactors.org. ^ "ATX12V Power Supply Design Guide, v2.2" (PDF). formfactors.org. ^ Nathan Kirsch (2005-03-30). Skyhawk PSU ATX12V & EPS12V Compliance. Legit Reviews. Retrieved 2009-09-24. On the front of the box it says "Triple Rails for +12V" and then goes on to say 'Intel ATX 12V Version 2.0 & EPS 12V Version 2.1". It turns out from our investigation that the above power supplies do not meet the ATX12V or EPS12V standards as the packaging claims. ^ "OCZ GameXstream 700 W Power Supply, Hardware Secrets". Archived from the original on 2007-09-27. Retrieved 2008-04-20. ^ a b "Power Supply Fundamentals (page 3)". silentpcreview.com. Retrieved 2008-04-20. ^ "Fujitsu 12V only concept whitepaper" (PDF). Retrieved 2012-01-26. ^ Christoph Katzer (2008-09-22). "Debunking Power Supply Myths". AnandTech. p. 3. Retrieved 2014-10-07. ^ "Cooler Master UCP Product Sheet" (PDF). Cooler Master. 2008. Retrieved 2014-10-11. ^ Martin Kaffei (2011-10-10). "SilverStone Strider Plus – 500 W Modular Power". AnandTech. p. 4. Retrieved 2014-10-11. ^ Rutter, Daniel (2008-09-27). "Lemon-fresh power supplies". dansdata.com. Retrieved 2008-09-28. The lemon-market in PC power supplies has now officially become bad enough that no-name generic "500W" PSUs may actually barely even be able to deliver 250 watts. A realistic constant rating for these units is more like 200 watts. So the capacity inflation factor's hit 2.5, and it's still rising. ^ "High-Performance Power Supply Units". Tom's Hardware. Archived from the original on 2012-12-16. ^ "Ecova Plug Load Solutions" (PDF). 80plus.org. ^ "Modern Form Factors: ATX And SFX - Power Supply 101: A Reference Of Specifications". Retrieved 2018-04-19. ^ "Modern Form Factors: EPS, TFX, CFX, LFX, And Flex ATX - Power Supply 101: A Reference Of Specifications". Retrieved 2018-04-19. ^ a b "Fujitsu 250 W supply specification" (PDF). Retrieved 2012-01-26. ^ Gerow, Jon (2006-08-10). "Modular Power Supplies: The Reality of the Resistance". motherboards.org. Retrieved 2008-03-30. ^ "Power Supplies TekSpek Guide - SCAN UK". scan.co.uk. Retrieved 2018-12-30. ^ "HACKING DELL LAPTOP CHARGER IDENTIFICATION". hackaday.com. Retrieved 2015-11-30. ^ "In the World of Power Supplies, Don't Mistake MTBF for Life Expectancy" (PDF). batterypoweronline.com. June 2006. Retrieved 2014-06-29. ^ "M12 Power Supply Series". Seasonic. 2014-03-28. Retrieved 2014-06-29. ^ "MTBF: Misquoted and misunderstood" (PDF). xppower.com. 2011-03-21. Retrieved 2014-06-29. ^ John Benatti (2009-08-01). "MTBF and power supply reliability". electronicproducts.com. Retrieved 2014-06-29. ^ "Redundancy: N+1, N+2 vs. 2N vs. 2N+1". datacenters.com. 2014-03-21. Retrieved 2014-06-29. ^ "Power Supply Design Guide for Desktop Platform Form Factors, Revision 1.31" (PDF). Intel. April 2013. p. 26. Archived from the original (PDF) on October 21, 2014. Retrieved February 6, 2015. ^ "ATX Specification Version 2.1" (PDF). ^ "Untangling the wires: Getting to know your power supply". TechRepublic. 2007-06-08. Retrieved 2013-09-26. ^ Constantine A. Murenin (2007-04-17). Generalised Interfacing with Microprocessor System Hardware Monitors. Proceedings of 2007 IEEE International Conference on Networking, Sensing and Control, 15–17 April 2007. London, United Kingdom: IEEE. pp. 901–906. doi:10.1109/ICNSC.2007.372901. ISBN 1-4244-1076-2. IEEE ICNSC 2007, pp. 901—906.